Check Out Fall 2013 Stylish Colors and Trends! It seems as though the colors that are in actually are the colors of the leaves on the trees in the Fall. Now that we can finally see a glimmer of Fall in the distance- let’s talk style! When it comes to keeping up with trends, styles and fashion for every season, one of the easiest and most affordable ways to give your simple wardrobe a boost is by adding a hair accessory or head covering in a trendy print or color. Below we rounded up for you some of the most stylish colors this season. As opposed to this summer when bright neon colors and pastel colors were in style, this season we find ourselves with darker colors such as moss green, rust, burnt orange or any other color of that sort. It seems as though the colors that are “in” actually are the colors of the leaves on the trees in the Fall. For example, although Emerald is still not out of style this season, the new shade of green this season is definitely the Moss Green, which is in between an earthy olive and dark grey- a fresh and autumn color. What’s great about these dark colors is that they can be paired up with any other colors such as black, grey, denim, and much more! These colors give a sharp look and give a taste of Autumn. Another stylish color this season is White. Winter white gives a very fresh and cool look in the Fall. It makes you stand out and brings out the color from your face after a hot and sunny summer. Try wearing a fresh white pre-tied bandana or putting a cute white hair bow on your little one this season for a fresh Fall look. Hope all this information was helpful to all you fashion lovers – so give these colors a try and stay tuned to next week when we will talk about the different prints that are in style this season! 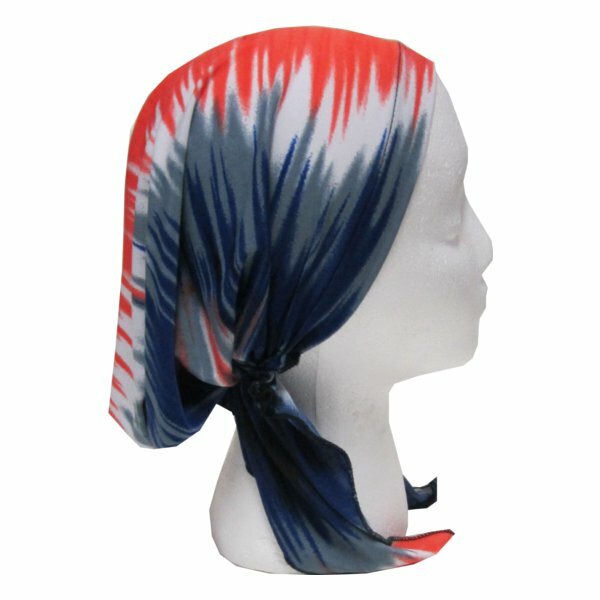 Pre-tied Bandanas are a relatively new Head Covering but have quickly become one of the most popular of all Womens Headcoverings. First off, there’s the ease of use. For many people used to wearing bandanas or Israeli tichels Pre-tied Bandanas are a life changing experience – you just put it on and go, no tying necessary! Then there are the multiple styles you can use it for. Well, even though the essential Pre-tied Bandana remains the same no matter what, which is basically a cloth head covering gathered in the back with an elastic and two tails hanging down, the usage can vary. You can wear it simply as a “Pre-tied Bandana style” which is the most common. Then there is the increasingly popular “tails tucked under”. Then of course there is the Bandana style. And last but not least is the Israeli Tichel style. So there you have it: One head covering that can be worn in 4 different ways! How’s that for versatility? Another popular aspect of Pre-tied Bandanas is the many different fashion styles they come in. For those that enjoy a unique piece that matches their outfit, the wide variety of looks and colors in the Print Pre-tied department are unparalleled in womens headcverings. You can really find a color and Pattern that matches any outfit you have! Then for those that want something a little more elegant for Shabbos or special occasions you have the Applique Pre-tied department which features such stunning pieces as DaCee’s Royal Stone Pre-tied. Want to know another contributor to the popularity of the Pre-tied Bandana? It’s all in the fabric! For a hot summer day there’s nothing like a cool cotton Pre-tied bandana and for a cold winter day The velour (also known as velvet) Pre-tied is really cozy! What about after the shower or around the pool? Well there’s the terry Pre-tied bandana’s for that which are way easier to use then a towel wrapped around your head! Well I think we’ve demonstrated some of the benefits of the Pre-tied Bandanas, So let’s end off with a tip. If your Pre-tied is a drop to large and slipping off your head then simply tie the tails in the back till it reaches the desired comfort, it’s as easy as that!